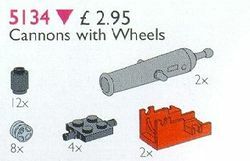 5134 Cannons and Wheels is a Pirates Service Pack set released in 1995. It includes 28 pieces, enough to build two cannons with six cannonballs (1 x 1 cylinders) each. This set is the same as 5139 Pirate Cannons. Facts about "5134 Cannons and Wheels"
This page was last edited on 15 March 2016, at 05:52.